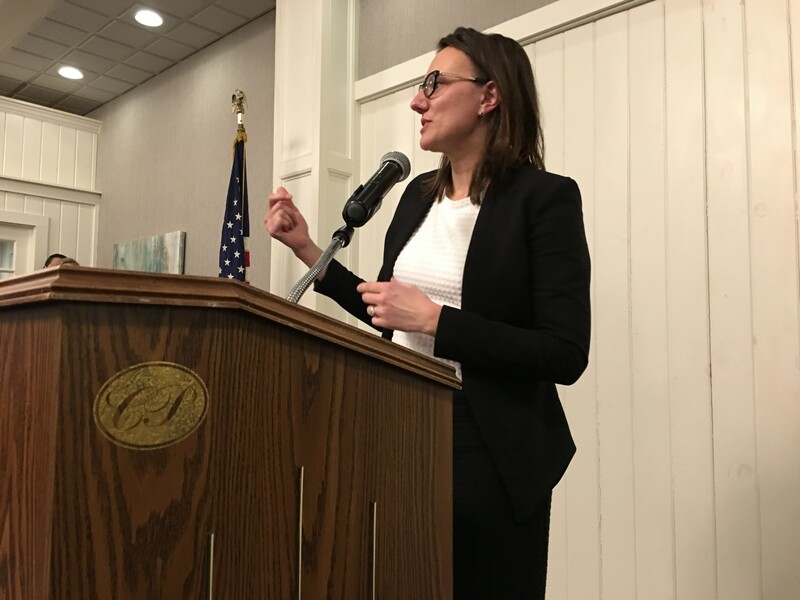 Democratic lawmakers, party leaders and Statehouse lobbyists gathered Wednesday night at the Capitol Plaza Hotel & Conference Center in Montpelier for a fundraiser carefully crafted to avoid violating legislative rules. The guest of honor was House Majority Leader Jill Krowinski (D-Burlington). Multiple Democrats praised her work as a party builder — and talked of her as a future candidate for U.S. Congress. Clearly, Krowinski is seen as a rising star in Vermont Democratic circles. Proceeds from the "Speaker's Soiree" went to the state party, not to lawmakers or their political action committee. In 2015, the legislature passed a bill prohibiting lawmakers from seeking lobbyist contributions during sessions. The following year, House Democrats dissolved their political action committee. Their fundraising events continued, but the proceeds went to the Vermont Democratic Party. The invitation to the ninth-annual soiree included a small-print disclaimer to display compliance with the law: "House Democrats are not soliciting funds from lobbyists or lobbyist employers for this event." Still, while lawmakers were not themselves making the ask, they were the featured attraction. Their presence was the reason lobbyists paid between $100 and $1,000 per ticket for the chance to hobnob with members of the majority caucus. "For me, it’s a good opportunity to talk to people and make sure our clients are represented," said Justin Johnson, lobbyist with MMR, a firm that represents numerous corporate interests. During the 2017-18 session, Johnson's client list included Microsoft, ExxonMobil, drug maker Abbott, Vail Resorts, Green Mountain Power, Vermont Gas, Walmart, and two independent schools: St. Johnsbury Academy and Burr and Burton Academy. "No, absolutely not," Johnson said when asked if he expected any quids for his pro quo. "Just an opportunity to meet people. There’s no grand plan." "It is legal," insisted Terje Anderson, chair of the Vermont Democratic Party. "There's no direct benefit for lawmakers. It’s a way to get money from these [lobbyists] to support a political party." Which, in turn, will support lawmakers' reelection campaigns. "Lobbyists have plenty of access," Anderson said. "This isn’t unique. I don’t see a serious ethical issue." But then he added, "Would I prefer a system of public financing where we wouldn’t have to beg for money? Hell, yeah." Anderson said the event raised approximately $20,000 for the party. No money for guest of honor Krowinski, but plenty of appreciation bordering on adulation. "She is the drive and the vision behind the Democratic majority we have today," House Speaker Mitzi Johnson (D-South Hero) told the crowd of more than 100 people. Symington brandished a recent New York Times photo spread featuring the women of the 116th Congress. "When Vermont finally joins the other states in electing a woman to Congress, I’ll bet Jill Krowinski will be in that picture," Symington said. Others echoed the sentiment that Krowinski is a politician destined for D.C. When asked about the Congressional chatter, Krowinski demurred. "I’m so happy where I am right now," she said. Which means being majority leader — and also the new executive director of Emerge Vermont, a nonprofit that helps Democratic women run for office. Her hiring was announced on Wednesday. She takes over for Sen. Ruth Hardy (D-Addison), who announced she would leave her post after winning election to the Senate. "It’s time to take the organization to the next level," Krowinski said. "We need to elect a woman to Congress and get more women elected in cities and towns. There’s also a lack of women working on campaigns. We need to eliminate the old boys’ club." Whether as candidate or operative, Krowinski seems destined to play a key role in breaking down the clubhouse doors.